There are certain characters that, right out of the gate, become instant pop-culture sensations. The meteoric rise of characters such as Superman and Spider-Man cannot be denied, and their continued triumph at the forefront of super-hero subculture is a testament to how well they resonate with fans. And while there are those characters that find a quick shortcut to success and stardom, there are others who take a more… meandering path towards that same destination. Some characters get introduced in one-off stories and are never expected to see the light of day again, destined to remain a footnote in the dusty long box of comic’s history (Remember Glazier or Kurrgo? How about Dreadlox? Yeah, me neither). But every once in a while, someone manages to climb their way out of the box for another chance to find that coveted pop-culture glory. This week’s Unsung Hero did just that. She is the unsinkable, unstoppable, and unbeatable; Squirrel Girl. When Doreen Green was 10-years-old, something in her genetic makeup suddenly changed, which lead to the growth a fluffy, prehensile tail as well as an increase in her overall strength and agility. If that wasn’t strange enough, she could also communicate with squirrels! At first, her parents thought Doreen may have been a mutant, due to how suddenly her powers manifested. However, a medical doctor was able to determine that she was not, in fact, a mutant, but rather something else entirely. What that is, well… no one knows exactly. At age 14, Doreen struck out on her own to prove herself as a super-hero, and by chance encountered Iron Man. Along with her squirrel companion, Monkey Joe, she tried to convince the Avenger that she should be his sidekick! Iron Man initially turned her down, but after witnessing her defeat Doctor Doom with only her wits and a swarm of squirrel allies, said he would put in a recommendation for her with the Avengers… once she was older. And so began the super-hero career of Squirrel Girl! Since then she has joined many different teams, including the Great Lakes Avengers and the no-joke, absolutely real Avengers! In fact, she was also hand-picked by Luke Cage and Jessica Jones to be the nanny and protector of their daughter, Danielle. Doreen has the proportional strength and agility of a squirrel, which as I’m sure you know, would make her very strong and very quick. She also has a prehensile tail, which is between 3 and 4 feet long, yet can tuck comfortably into a pair of (roomy) pants if she needs to go incognito. She has superb hand-to-hand fighting skills, and can go toe to toe with some of the best fighters in the Marvel Universe. If need be, she can also use her razor sharp claws and teeth to cause some real damage. As a last resort, Squirrel Girl has a retractable knuckle bone spike that pops out of her hands. However, she often forgets about them as she doesn’t usually have a reason to go around and stab people. What she is most known for is her ability to talk to squirrels, and she often recruits their assistance in stopping evil. These little critters can savagely take down even the strongest of foes! Not only that, but her main squirrel companions, Monkey Joe and Tippy-Toe, stick by her through thick and thin and help her fight crime in any way they can (RIP, Monkey Joe, you are greatly missed). 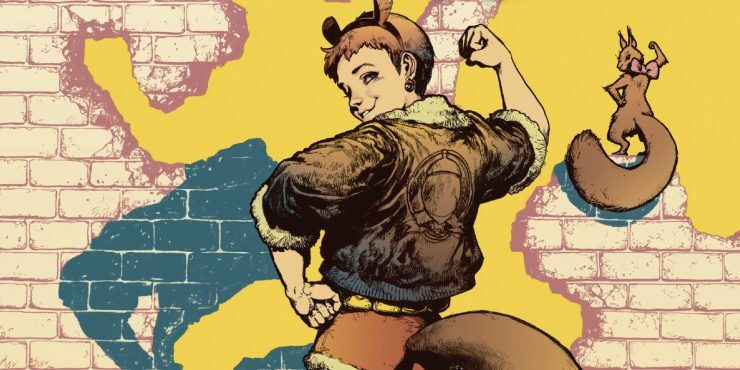 Squirrel Girl made her first appearance in Marvel Super-Heroes #8 (1991), and she was created by Will Murray and Steve Ditko (Yes, that Steve Ditko). She wasn’t intended to be more than just a one-off character, and after her first appearance, she disappeared from comics for about ten years, with only a sporadic mention here and there. However, her first appearance did leave an impression on people, as she defeated one of the baddest of the bad, Doctor Doom. Since then, Squirrel Girl has gone on to defeat many opponents considered to be much stronger than herself. These include (so far) Fin Fang Foom, Deadpool, M.O.D.O.K., Wolverine, Korvac, Baron Mordo, Bi-Beast, Maelstrom, Terrax, Galactus, Ego the Living Planet, and even Thanos (Yes it counts, The Watcher said so). They don’t call her ‘unbeatable’ for nothing! You can find the continuing adventures of Squirrel Girl in her monthly Marvel comic series, The Unbeatable Squirrel Girl. You can also find her previous adventures with the Great Lakes Avengers, The New Avengers, and the U.S. Avengers in trade paperback, as well as her graphic novel, The Unbeatable Squirrel Girl Beats Up the Marvel Universe. So break out that bag of cashews and settle down for an evening of good reading. Squirrel Girl will also be featured in the upcoming animated feature film, Marvel Rising: Secret Warriors, that will be releasing later this year. 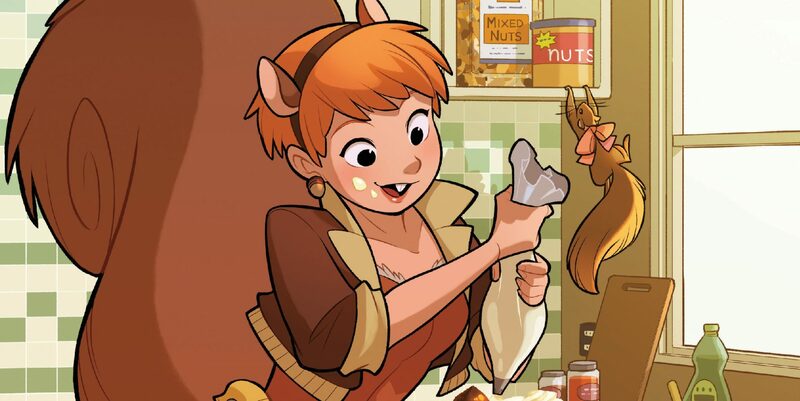 She is voiced by Milana Vayntrub, who is also scheduled to eat nuts and kick butts playing Doreen in the live-action New Warriors show that Marvel has in development! Not bad for a character who was relegated to that dusty, old, forgotten comic long box, eh? Do you have an unsung comic book hero or villain you’d like to see profiled in this series? Leave a comment below with a lesser-known character you love, and you might just see them pop up in a future article! Geek Headlines- Jamie Foxx as Spawn, Pokemon: Let's Go Pikachu, and More! Geek Headlines- New Wreck-It Ralph 2 Pictures, Fallout 76, and More!